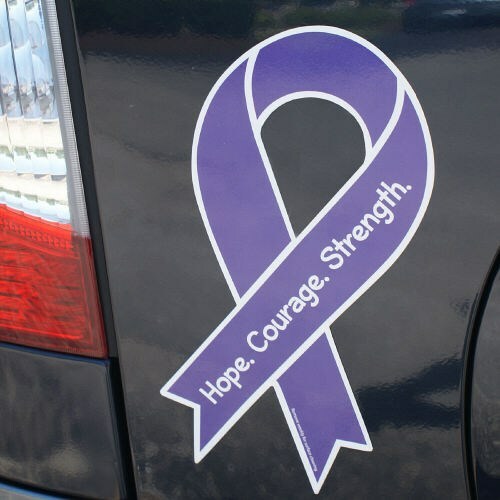 Help spread awareness while on the go when you place this Purple Awareness Ribbon Magnet on your car. The bright Purple color shows hope so people with Alzheimer's, Pancreatic or any disease with a purple awareness color can live a full and happy life. Showing your support with this Vehicle Magnet is just one step closer to helping individuals and families that need us the most. Our Purple Car Ribbon Magnets are specially designed and created to spread awareness and will adhere to any metal surface including cars, file cabinets, and refrigerators. Measuring 8"L x 4”W, each magnet includes the words Hope, Courage, & Strength. Always on my vehicle. Passed them out to family and they all put them on their bumpers. The more awareness them better! Love it...hard to find a purple one. The magnet will be on the back of my car to let others know that all those with various needs need to be encouraged to have hope, courage and strength for their journey. Additional Info Hope Ribbon Car Magnets are great for displaying on a vehicle, mailbox and most metal surfaces. Each Magnet is great for fundraisers and also serves well as party favors at giveaways events. Spread awareness and show support the easy way with this Hope Magnet along with our Personalized Survivor Awareness Apparel, Alzheimer's Awareness Apparel, Lupus Awareness Apparel and our Pancreatic Awareness Apparel today.